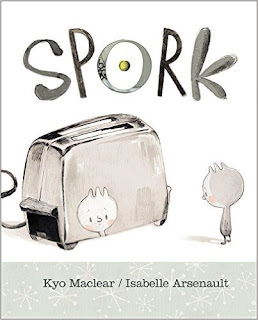 Yesterday, I read the charming book Spork by Kyo Maclear (illustrated by Isabelle Arsenault) with my kids. Spork is a story about, well, a spork. In case you do not know, a spork is part spoon/part fork. Since Spork is too round, he doesn’t quite fit with the forks. Since Spork is too pointy, he doesn’t quite fit with the spoons. Spork spends his days trying to know where he belongs. In between the wonderful illustrations and the great rhythm of the lines, your children will learn that it is okay to be different. The book brought smiles to our faces as we giggled at the thoughts of our cutlery come to life. For example, Spork is envious he doesn’t get to take a giant sudsy bubble bath at the end of the day (or what we know as the dishes being washed) because he is never used. But, one day, Spork learns that while the forks may be good at poking and the spoons may be good at stirring, sometimes a person needs both. That’s how Spork discovers sometimes it is best to fit into more than one box. This children’s book shows little ones that they do not have to fit into one category – they can do or be lots of things! The paperback version of this book will be released in April. I highly recommend this unique story to families with children, especially those who struggle with knowing where they fit. * You may purchase a hardcover edition of this book from amazon. This is an affiliate link. Thank you for supporting my blog!